Attracting hummingbirds to your garden is easy either by planting flowers that they like or providing a feeder filled with nectar. This is a guide about buying hummingbird feeders. 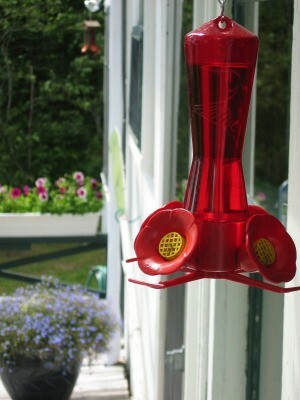 I would like to put a hummingbird feeder on my window, but can't seem to find any of these kind of feeders anywhere. It is a small plastic feeder that attaches to a suction cup on the window. I've looked almost everywhere from Walmart, Meijer, Target, Home Depot, a few pet stores, and Aco hardware and can't find any. Does anyone know where I can buy one in the Brighton, Michigan area? I really don't want to order one on eBay or Amazon since the hummers come early around here about May 5th or 6th. Any information would be helpful. Your best bet is going to be ordering one off the internet. Another option may be Lowes or Home Depot. An alternative to the indow mounted type is buy a flower pot hanger. Either the type that goes in the ground that comes up with a hook. You can turn it to be in front of your window and hang a feeder on it. OR you can get a hanger that you mount to the house and swings around in front of the window. Hang a feeder from it. Not many other options. I take that back, look and see if there is a store in your area that sells unusual house hold stuff. The place won't be a big brand name store, more like a mom pop shop. A local interest shop. The proverbial "hole in the wall" type of place.